You can see the full editorial in the Havering Post, Romford Recorder and Brentwood Recorder newspapers this week! You simply only have to say the word Aintree and for millions of people across Britain, and the world for that matter, their thoughts will automatically be of the Grand National. The race has a long history. The story goes that in 1829 the landlord of the Waterloo Hotel in Aintree, a Mr William Lynn, created a new racetrack close to his own pub. Six years later in 1836 they opened a new grandstand at the track and a four mile steeplechase held that day was won by Captain Martin Becher riding The Duke. 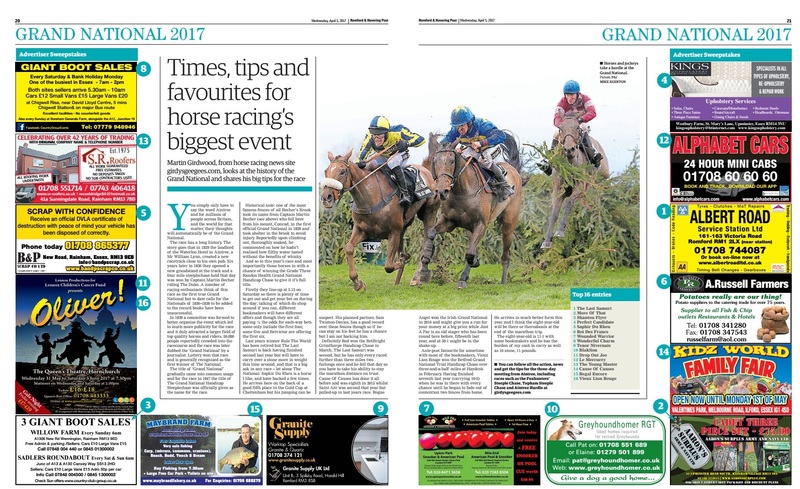 A number of racing enthusiasts think of this race as the first true Grand National but to date calls for the Nationals of 1836–1838 to be added to the record books have been unsuccessful. In 1839 a committee was formed to better organise the event which led to much more publicity for the race and it duly attracted a larger field of top quality horses and riders. 50,000 people reportedly crowded into the racecourse and the race was later dubbed the ‘Grand National’ by a journalist. Lottery won that race and is generally recognised as the first winner of The National. The title of ‘Grand National’ gradually came into common usage and for the race in 1847 the title of The Grand National Handicap Steeplechase was officially given as the name for the race. Historical note: one of the most famous fences of all Becher’s Brook took its name from Captain Martin Becher (see above) who fell here from his mount, Conrad, in the first official Grand National in 1839 and took shelter in the brook to avoid injury. Reportedly upon climbing out, thoroughly soaked, he commented on how he hadn't realised how filthy water tasted without the benefits of whisky. And so to this year’s race and most importantly those horses in with a chance of winning the Grade Three Randox Health Grand National Handicap Chase to give it it’s full title. Firstly they line-up at 5.15 on Saturday so there is plenty of time to get out and get your bet on during the day; talking of which do shop around if you can, different bookmakers will have different offers and though they are all paying ¼ the odds for each-way bets some only include the first four, some five and Betvictor are offering the first six. Last years winner Rule The World has been retired but The Last Samuri is back having finished second last year but will have to carry over a stone more in weight this time around and that is a big ask in any race let alone The National. Saphir Du Rheu is a horse I like, and have backed a few times, he arrives here on the back of a good fifth place in the Gold Cup at Cheltenham but his jumping can be suspect .His planned partner Sam Twiston-Davies has a good record over these fences though so if he can stay on his feet he has a chance but I am not backing him. Definitely Red won the BetBright Grimthorpe Handicap Chase in March, The Last Samuri was second, but he has only every raced further than three miles two furlongs once and he fell that day so you have to take his ability to stay the marathon distance on trust. Cause Of Causes has done it all before and was eighth in 2015 whilst Saint Are was second that year but pulled-up in last years race. Rogue Angel won the Irish Grand National in 2016 and might give you a run for your money at a big price whilst Just A Par is an old stager who has been round here before, fifteenth last year, and at 50-1 might be in the shake-up. Ante-post favourite for sometime with most of the Bookmakers Vieux Lion Rouge won the Betfred Grand National Trial Handicap Chase over three-and-a-half miles at Haydcok in February. Prior to that in December the chestnut coloured gelding won the Betfred Becher Handicap Chase, which is run at Aintree over three miles one furlong and uses the Grand National fences. With an official rating of 149 he is due to carry 10 stone 11 pounds at the time of writing having finished seventh last year (carrying 10-5) when he was in there with every chance until he began to fade out of contention two fences from home. That official rating is due to rise to 155 after the race so in theory he is 6lb ‘well-in’ in the handicap. He arrives in much better form this year and I think the eight-year-old will be there or thereabouts at the end of the marathon trip. Trainer David Pipe is hopeful saying earlier this week: "He is in good form, a week is a long time with horses but he is in good form at present and we will try to keep it that way. He had a break after his last race building him up to next weekend. Tom will be in to school him this week. Hopefully it will be OK and then away we go." The eight-year-old is 11-1 with some bookmakers and he has the burden of my cash to carry as well as that 10 stone 11 pounds.